Are you trying to get an understanding of different Customer Relationship Management (CRM) platforms? In this article we will review Zoho CRM. Zoho is a provider of a very popular award-winning and cloud-based CRM solution as well as more than 25 online applications. So if you want to know more about Zoho, the features of this CRM platform and the pricing, keep on reading. Zoho CRM is an online customer relationship management software for managing your sales, marketing and support in a single system. Zoho was founded in 1996 in California by founders Sridhar Vembu and Tony Thomas. Their global headquarters are in Chennai in India but they serve worldwide. They have offices in seven other countries: USA, Japan, UAE, Australia, China, Singapore and the Netherlands. Moreover, Zoho supports 25 languages. Worldwide Zoho has over 150,000 customers with over 30 million users and nearly 5,000 employees across the globe. Through Zoho CRM businesses of all sizes are able to build excellent customer relationships, with features like an inbuilt AI sales assistant, sales pipeline management, marketing automation, analytics and more. Zoho’s CRM software acts as a single repository to bring your sales, marketing and customer support activities together, and streamline your process, policy, and people in one platform. The platform can be easily tailored to your business needs and has many features. First of all, it lets you create and reorganize modules. You can add custom fields and sections. Secondly, you can create your new layout and even clone layouts. Also, you can create templates in Zoho CRM. Furthermore, it allows you to do all sorts of activities, like sending follow up emails, updating records and assign tasks. You can boost your teams productivity by creating work flows. Lastly, you can create a blue print to mandate the conditions your sales people need to follow to close deals. These are just a few examples of the things you are able to do with Zoho CRM. For a complete overview of all the features you can have a look at the Zoho CRM website. A fun addition to Zoho CRM is that it comes with an AI powered system. There is a conversational sales assistant called Zia. Zia analyses the data each rep enters and the tasks they complete every day to predict the outcome of sales activities. Zia also offers solutions to complete these activities smarter and faster. Ask Zia for any information from your CRM database by calling or chatting with her. Moreover, with the industry’s first multichannel CRM you can easily connect with your customers on e-mail, phone, shared and social media. You can track all your conversations in one place. Zoho CRM also offers in-depth CRM analytics to help you make smarter business decisions. Through performance matrixes, heat maps, activity stats, pie charts, meters and funnels you are able to create customized dashboards. You can also review Zoho CRM on your own phone through the many mobile apps of Zoho CRM. They are engineered for ease, speed, and enhanced functionality to manage your business on the go. You can request a 15-day free trail, for companies of all sizes and industries. There is even no credit card required. After that, you can choose between three Zoho CRM editions: standard, professional and enterprise. Prices differ from €12,- till €35,- per user per month based on a yearly subscription. The most popular edition is enterprise. 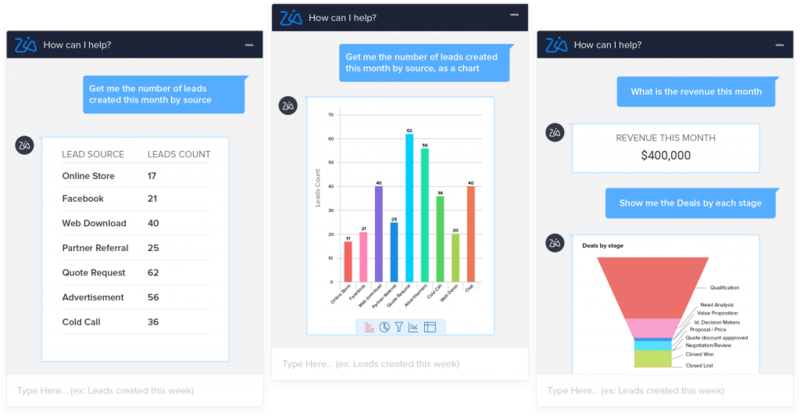 This edition has included almost all features, including the AI assistant Zia. The other editions have fewer features. There is also an ultimate edition available for €100,- per user per month billed annually and a Zoho CRM Plus edition from €50,- per user per month billed annually. In addition, Zoho CRM also has a free edition which includes 3 free users. This edition includes essentials like leads, documents and mobile apps. It’s very handy for your home business. To conclude this Zoho CRM review, it offers a wide range of benefits. It automates vital sales operations, gives access to important data in real time, makes maximal use of social media, allow you to go mobile and it is integrated with many Google Apps. But there is also room for improvement. For instance, there are no tutorial guides to show the use of the platform. So you need some knowledge about CRM tools and which module you do and don’t want to add. If you are looking for a comprehensive and very well priced CRM platform and have some knowledge about CRM tools then Zoho CRM might be right for you.